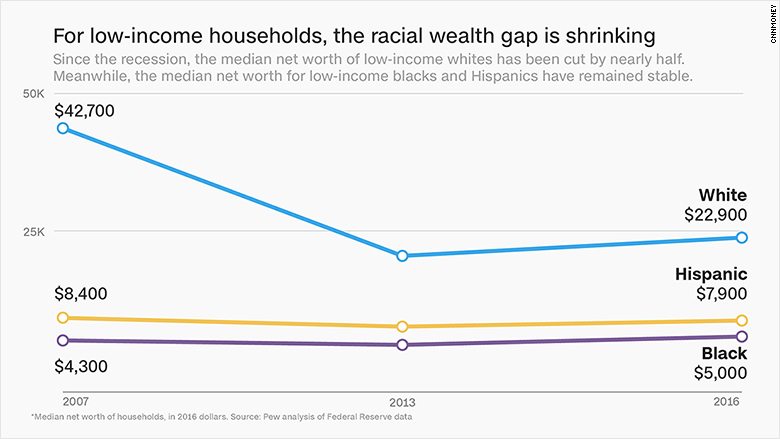 America's wealth gap is getting even bigger. 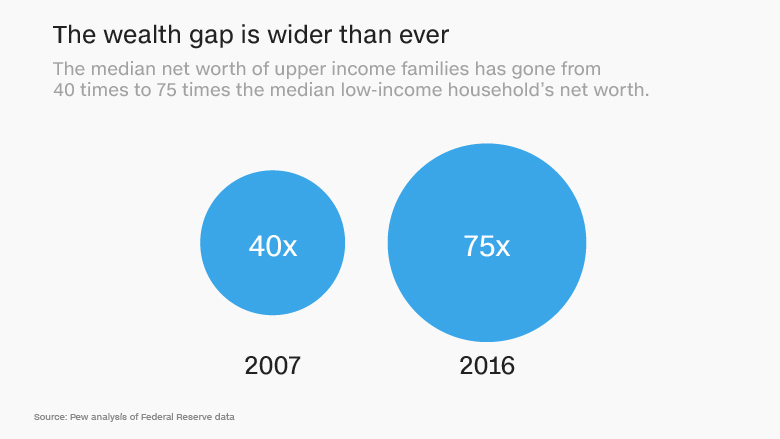 While wages for low- and middle-income workers have begun to recover, wealth inequality has still climbed to new heights, according to a new survey from the Federal Reserve which conducts a checkup of the nation's finances every three years. In 2016, median household net worth improved across all income brackets -- up 16% overall since 2013 -- but those on the higher end of the income spectrum did the best. The top 10% of earners saw their household net worth increase 40% over the three-year period, according to the Fed. 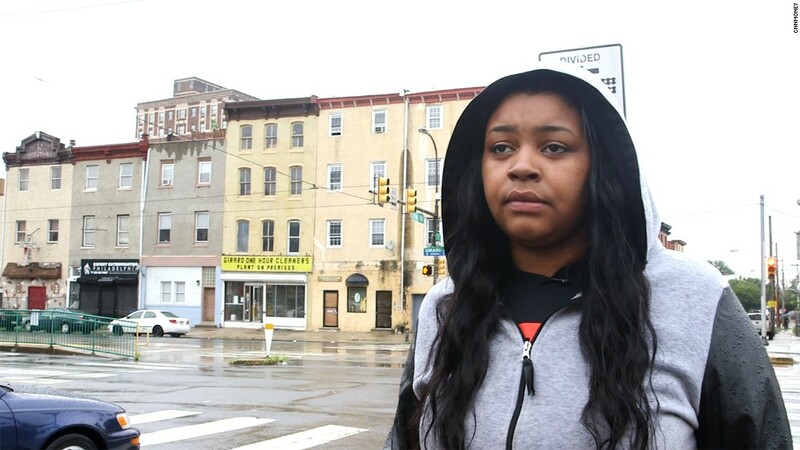 That has increased the nation's already large economic divide. Here's one way of understanding the difference that makes. 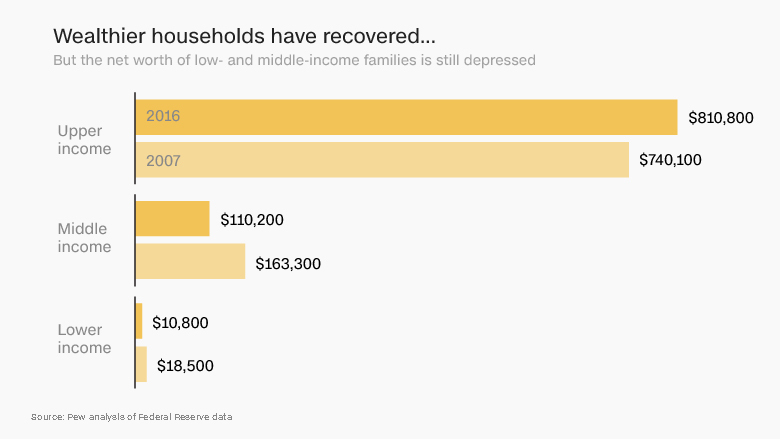 The median upper-income family (those who make more than $127,600) now holds 75 times the wealth of the median low-income family (those who make less than $42,500), according to an analysis of the data by the Pew Research Center. In 2007, top earners were worth 40 times as much. In 1989, the multiple was 28. Here's another way of understanding it: The Top 1% now holds 38.6% of the nation's wealth, up from 33.7% in 2007. The bottom 90% now holds only 22.8% of the nation's total wealth, down from 28.5% in 2007.